No, it’s not the mystery; it’s her incredibly deft use of the English language—her dialogue, her descriptions, her literary references—and how she makes these people come vividly alive on the page. While it is not essential, I would strongly suggest reading all the Lord Peter Wimsey books in the order of publication* to enjoy both these two character’s growth, as well as the development of their relationship. When Harriet Vane attends her Oxford reunion, known as the “Gaudy”, the prim academic setting is haunted by a rash of bizarre pranks: scrawled obscenities, burnt effigies, and poison-pen letters—including one that says, “Ask your boyfriend with the title if he likes arsenic in his soup.” Some of the notes threaten murder; all are perfectly ghastly; yet in spite of their scurrilous nature, all are perfectly worded. And Harriet finds herself ensnared in a nightmare of romance and terror, with only the tiniest shreds of clues to challenge her powers of detection, and those of her paramour, Lord Peter Wimsey. There are so many things wrong with the preceding paragraph that I scarcely know which one to address first! Okay, that’s a lie: people, paramour means illicit lover. Lover! For cripes’ sake, the whole novel revolves around the fact that Harriet has not accepted Peter’s suit—hell, she has spent more time pushing him away than tolerating his friendship. And for the most part, tolerating is the right word to use there. Lover, indeed! Hmph! As the novel starts, Harriet Vane decides to attend her alma mater’s annual alumni reunion, known as the Gaudy, as a way of exorcising her demons—the notoriety brought on by the murder of her erstwhile lover, Philip Boyes. About five years prior, Harriet was tried for murder, and only Lord Peter Wimsey’s intervention saved her life—by finding the actual murderer. In the intervening years, Harriet has struggled to rebuild a sense of self respect and self worth, as well as to figure out her true feelings towards Peter. One of the consequences of this visit is Harriet’s subsequent involvement in the investigation of a series of unexplained, and rather bizarre, events happening within the walls of her alma mater, the fictional Shrewsbury College. From outright vandalism to anonymous letters, the potential scandal would have disastrous consequences for women’s higher education (it’s worth noting that Gaudy Night is set, and was written, in the early to mid-1930s). In part out of intellectual curiosity, in part out of gratitude for her former mentors’ ready acceptance of her as she is, Harriet embarks on a quest to find out who the perpetrator is and put a stop to all these shenanigans. Unfortunately for all involved, the investigation is neither as easy nor as expeditious as she and her professors would have liked. The novel covers a period of a little bit under a year, during which time the reader is introduced to a number of characters—all through the cynical eyes of one Harriet Vane. This is an important consideration, because as time passes we see her grow out of many of her preconceptions, while trying to come to terms with others—the most important of which is her refusal to accept her true feelings for Peter. I found it quite interesting that during the period covered by the first two thirds or so of Gaudy Night, Lord Peter is off solving mysteries and having interesting adventures, which are narrated in Murder Must Advertise and The Nine Tailors, the two novels released before this one. I imagine that the original readership had many fewer questions than I did about a number of details. For example, the life at Oxford is completely alien to me. Schools, vivas, dons, deans, fellows, tutors, proctors, and what-not. Then we have mail schedules, domestic arrangements and other commonplace things that are, seventy years later and on the other side of an ocean, very different than how Ms Sayers’ depicts them. It is one of the many indicators of the author’s mastery of her craft that all of the above doesn’t interfere with the reader’s enjoyment of the story. The novel approaches many topics that were, I’m sure, quite uncomfortable at the time of publication: sexism, politics, feminism, etc. The topic of lesbianism is hinted at, as done in several of the previous Lord Peter Wimsey novels, in a very sensitive manner while being matter of fact about it. And through it all, Ms Sayers manages to slip a number of sly jabs at the publishing side of writing—from blurb writers to foreign edition translators to readers. In the end, Gaudy Night is absorbing to an enormous degree—for a book which theoretically has no great drama, this is one that grabs me by the heart as few others have. Lovely review. 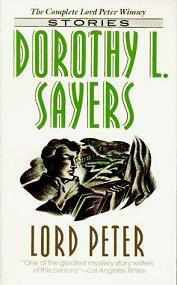 I think I had commented before that Dorothy Sayers is a comfort read for me. I hate flying but when I had to fly for interviews I would rotate Strong Poison/Have His Carcase/Gaudy Night and Busman’s Honeymoon. So many good scenes, and you really get to see the vulnerabilities of Wimsey. A couple of scenes that stand out were the entire chessman scene and I love the poem scene. Also how he deals with his nephew. The language is just beautiful. Have you read Sarah Caudwell’s books? Thus Was Adonis murdered is good. She has a similar gift with language. Wonderful review! 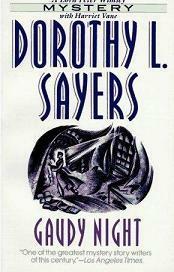 I’m a huge fan of the Lord Peter Wimsey books & gaudy night is one of my favourites. I love the book. At this point, I’ve read it so often that I usually skip out the bits which carry the actual detective story, and just read the rest. And I especially enjoy all the letters – I think that’s due to reading Daddy Long Legs at an impressionable age. My favourite part about the writing is where Harriet goes to the literary party and everyone is upset about a novel called ‘Mock Turtle’ winning some award, though it turns out most of them haven’t read the thing. Just strikes me as so true to life – you read the same sort of indignant comments about literary awards today. *happy sigh* This is my favorite book. Ever. I reread it every year. And I love the way Sayers talks about writers in this story, with Harriet’s struggles to write the latest mystery and the pokes at editors and jealous writers. I’ve found I can never go wrong reading this series. But I’d somehow missed this one coming out, so thanks for the review. It’ll defintely go in my TBR piles. I’m particularly looking forward to seeing the action through Harriet’s eyes. Thank you for another great review. 🙂 Wimsey is still my all time favorite detective, peerage or no 😉 And I must admit, I’m so glad Sayers wrote this book because I was getting so fed up with Harriet. 😛 The first Wimsey I read was Nine Tailors. That will always be my favorite. The fascination with change-ups holds to this day for me. But Gaudy Night is the next in line. I believe I need to pull them all out of ‘hiding’ and read them again. It’s been a couple years now. I’m going to have to start reading this series. I love the covers, too. It’s a shame that style of cover work seems gone with the ages. Oh, AZ! What a delight that you are reviewing these! This was the first DS book I read, recommended by a girl I worked with when I was a shop clerk, and oh, it really was so fine. I remember it feeling just so smart and engaging. I went on to read many others from here. I hardly remember some of them, as it was ages ago…maybe this means it’s time to read the whole damn series over again! The old cover, which called him her lover, always drove me crazy! Paramour is almost worse in a way, since Harriet is specifically annoyed by someone thinking that they would choose that particular venue for fooling around. The was the first Wimsey book I ever read, although I’d seen a couple of episodes of the tv series (which is why I grabbed the book when I saw it). I adore it for all the reasons you give, but one of the things I only appreciated on later readings was the way it stands on its own while still shedding light on some of the other books in the series.